1. Preheat the oven to 220°C, gas mark 7. Cook the macaroni for 2 minutes less than stated on the packet instructions. Drain, reserving 1 tbsp of the cooking liquid, then stir the courgette through the pasta; set aside. 2. In a bowl, mix together the crème fraîche, mustard, nutmeg, thyme leaves, 100g cheese and the reserved cooking liquid. Season, then toss though the pasta until well combined. 3. 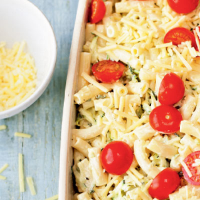 Transfer the pasta to an ovenproof dish, and top with the cherry tomatoes and remaining cheese. Bake for 15-20 minutes, until the top is golden and crisp. Serve with a green salad. Replace the courgettes with 1 small cauliflower. Cut into small florets and cook with the pasta for 5 minutes. Fry 70g diced pancetta until golden and crisp, then stir into the pasta along with the courgette and replace the thyme leaves with dill. Replace half the cheese with gruyère for a more intense flavour. This recipe was first published in Wed Jun 01 13:00:00 BST 2011.